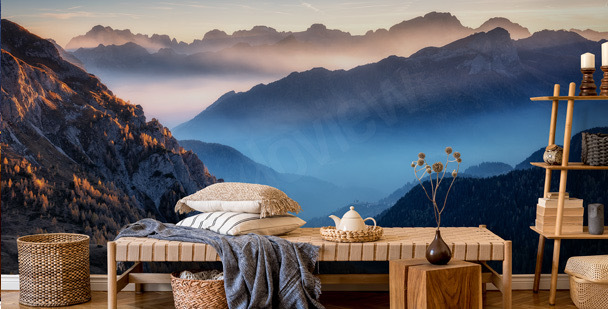 Mountain wall mural is an offer for people who love mountain climbing and reaching new peaks, as well as the ones who admire the beauty of the rocky ridges, only from afar. The snow-covered summits, green alpine tundra with wooden huts or the sun setting being rocky arêtes, are just a couple of countless options offered for our mountain murals. No matter if you live in a center of a huge metropolis, or in a small mountain cabin, mountains mural is a great solution for every interior. In a modern, industrial living room, mountains will break the city look and fit nicely with expressive, sharp lines of furniture. In a rustic interior, they will emphasize the nature themes and will look great with wooden folk furniture. 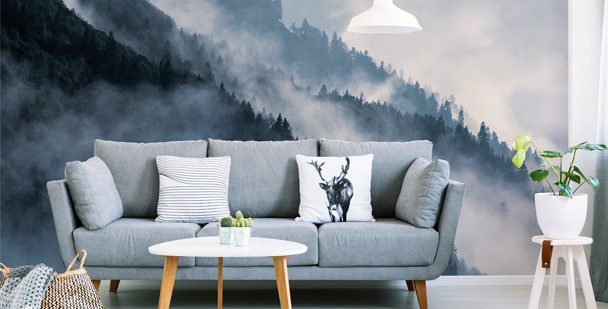 A mural with a snow-covered mountain forest will look great among raw concrete walls. A golden landscape of autumn mountains in form of a mural will fit perfectly into a classic bedroom decorated with bronzes and beiges. 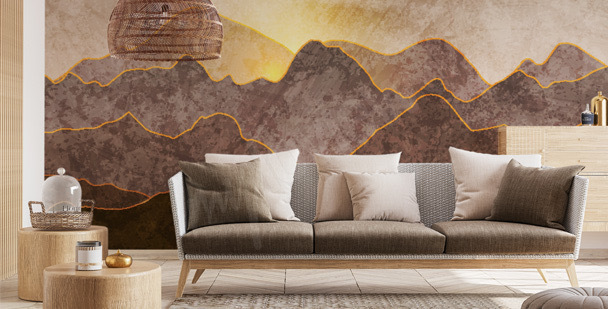 A mural with a unique motif of sepia-colored mountains will warm up an interior and give it a bit of mysterious atmosphere. For all enthusiasts of bright murals and winter atmosphere, we offer a mural with a snow-covered mountain landscape. 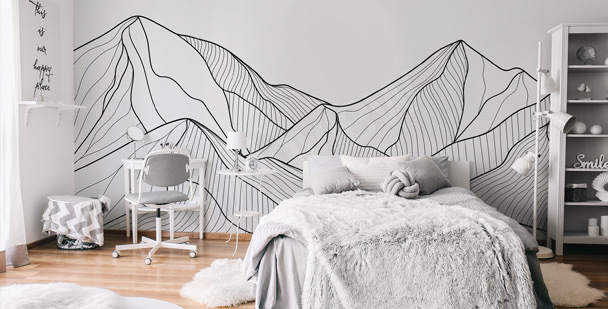 Minimalistic mural with a mountain image in grayscale will look great as a neutral background for expressive accessories and colorful furniture. 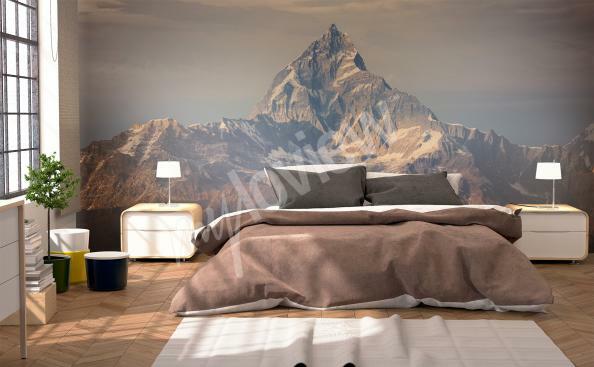 A colorful mural with an abstract mountain motive will look great in both, modern bedroom and teenager’s room. 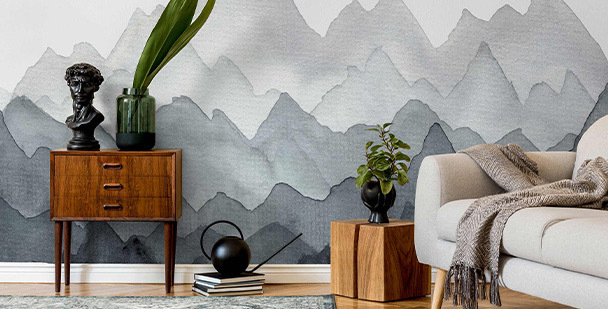 A mural with a classic motif of snow-capped mountain peaks is an offer for all enthusiasts of nature-inspired decoration. A climatic mural with mountain peaks, lit by sunset light, will stand out among bright brick walls. A dark mural with a minimalistic motif of foggy mountain peaks will be a stylish background for a bright bathtub. A majestic mountain range immortalized on a mural is a great decoration for apartments, bars and restaurants with highlander cuisine. 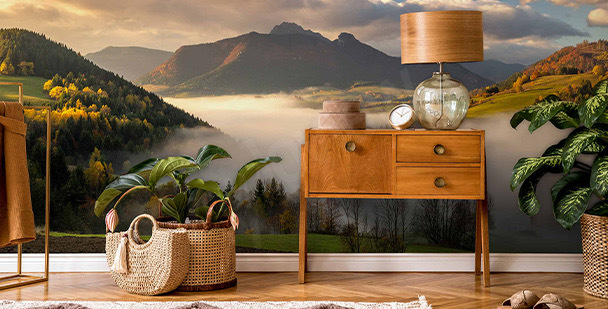 A mountain wall mural is a great offer for people who get their inspiration from nature. Mountains have always fascinated people. We were, and still are, equally afraid and full of admiration for their mysteriousness, wildness and unapproachability. This ambivalent, complex character of mountains have made them a very popular motif in literature. In Greek mythology we can read about Mount Olympus – the home of the Gods. They are also mentioned quite often in the Bible, where they are always named as places of remarkable happenings, like Mount Sinai. Himalaya wallpaper is a great decoration for interiors owed lovers of romantic legends and natural beauty. 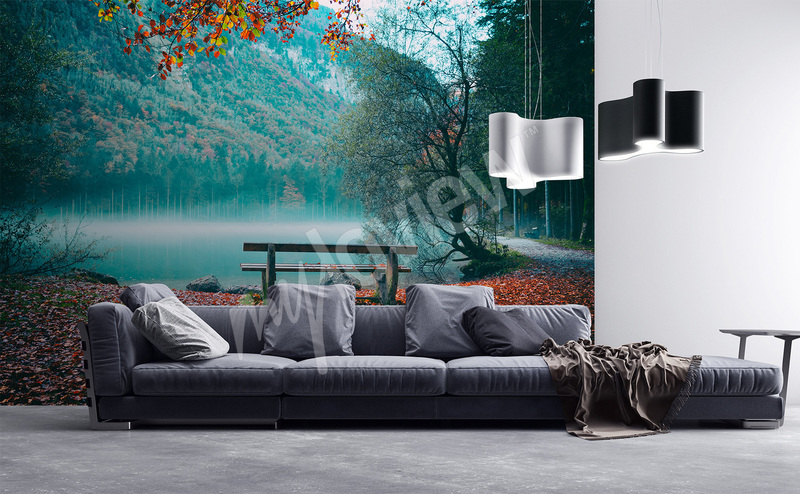 Mountain wall mural is not just another stunning living room decoration. It’s also a great way to optically enlarge a small interior. 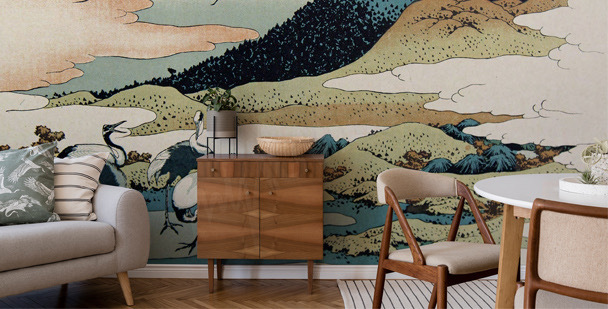 The effect of three-dimensionality that mountain mural has, will make our living room gain the sense of depth. As a result, the space will seem bigger that it actually is. Thanks to that, even the smallest room can be decorated practically and tastefully. If an interior is also characterised by poor lighting, it’s worth to choose Alps wallpaper in bright, vivid colors. A mountain motif will look great in a modern, monochromatic living room. A minimalist interior is a great place for an expressive decoration in form of a wallpaper with a strong design. Himalaya wallpaper will fit nicely with simple leather couches, glass and steel furniture, metal lamps and non-plastered concrete walls. The presence of nature, even in form of the wildest and harsh landscapes, will break the urban nature of the space and will introduce a colorful detail in form of green alpine tundra and blue sky. 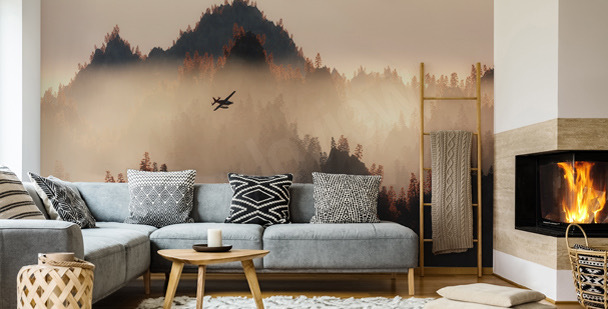 If you’ve managed to make the dream of many people come true and you’re living in a charming mountain cabin decorated in rustic style, then mountains mural will additionally emphasize the unique character of your interior. The wooden furnishing of space in form of construction beams and furniture decorated with folk designs, a stone-covered fireplace and open-work lamps with ethnographic designs will look great when complemented with a mountain mural, creating a stylistically coherent décor. If you have a problem in form of a small interior, a mountain wall mural 3D will optically enlarge your space. A romantic mountain landscape is a great idea for decorating a cozy bedroom, both in modern and rustic style. A full of life, green landscape will add energy to monochromatic interiors, and the sight of a sunset will create an idyllic atmosphere. On the other hand, a Himalaya wallpaper will correspond nicely to wooden furniture and fluffy white carpets imitating sheepskin. 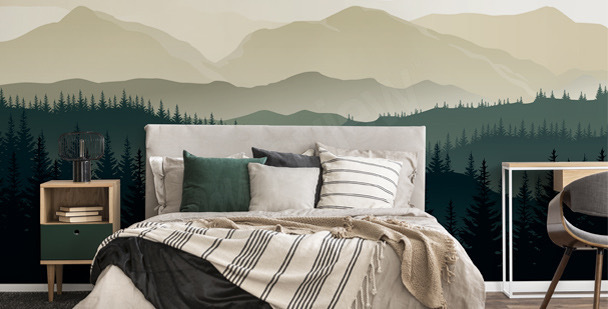 A mountains mural will look perfect in a room of a teenager, who loves mountain hiking. A minimalist illustration in form of expressive triangles symbolising mountain peaks, or a finely drawn panorama of Himalayan ridges, will create an original decoration that will fit modern furniture and contemporary design.